The Wonder Years are no strangers to delivering exceptional records, but, in their own words, new album 'Sister Cities' "is number one". The Wonder Years’ new album ‘Sister Cities’ starts with the band nursing a vending machine coffee in a rainy Kyoto. It ends with them missing everyone at once and longing for oceans. In the middle, two years of adventure. Of lessons learned, of friends found and of community extended. The whole trip is about “connectivity and empathy and understanding,” offers Dan Campbell. Those visions of life might be one small part of a much larger story, but it’s in those details that The Wonder Years shine. To them, everything matters. Stray dogs, paper cranes, wet matches. Those oceans, they capture the band’s glass half full to overflowing. “The earth is unified by water, that’s something that connects us to one another in a geographical sense,” Dan starts. “Your continent and mine could be considered to be divided by an ocean. I am considering them to be united by an ocean.” It’s an outlook that tears through the record; a bright side that knows things feel dark. And sure, The Wonder Years have always been about unity. They’ve celebrated what we have in common. They’ve always tried to be the friend you could turn to or lean on. From the basements and suburban streets, the band has tried to make good in face of the bad and told stories that carry, at the very least, a hope of resolution. But not on this scale. The eleven tracks of ‘Sister Cities’, each one confident and comfortable in their own space but tightly gripping the thread that’s passed along, manage to dig deeper and reach higher. With the stories set in the months and years that followed ‘No Closer To Heaven’, it sees the band constantly on the move and constantly somewhere new. Inspired by the never-ending journeys, the record also comes with a book of photographs, tour journals, poetry and drawings. 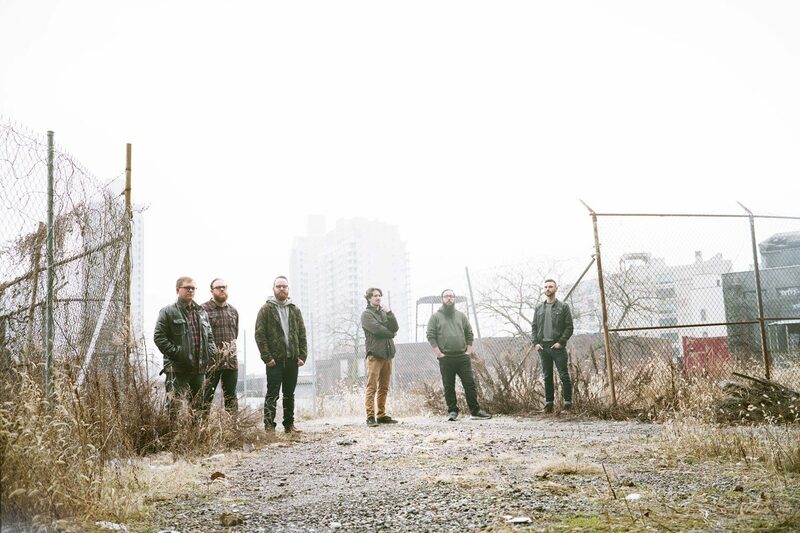 As the band get bigger and the songs more global, The Wonder Years still value that individual. They care about everyone all at once, and so that’s who they’ve written an album for. The idea started while The Wonder Years were touring the UK with Enter Shikari in early 2016. They had only just released ‘No Closer To Heaven’ so “we weren’t thinking about a new record yet”. What they were thinking about though, was all the touring opportunities that had begun to pop up. “We were in England, and we knew we’d be doing a tour in the States with Letlive. (RIP), and we knew we had opportunities coming up to do Australia and Japan and Europe, and then South and Central America for the first time. We always had this dream of making a documentary about all the touring we were doing, all the places we were going, and it never really felt particularly feasible. The Wonder Years like to make sure they get things right. “We want to write a better record every time we write a record, so it has to be more ambitious, right? It can’t be the same or less, or it wouldn’t be a better record.” In everything the band do, from interviews to artwork, The Wonder Years want it to have value. “We put in an immense amount of work to make sure that happens. We’re not comfortable making something that doesn’t feel valuable. We’re going to push hard to make art that has value. If we don’t feel capable of that, we won’t make that art. We’ve never shied away from the hard work aspect of it. We wanted to create a piece of art that was more encompassing than we’d be able to create before. We didn’t want to phone in any element of that. “In hindsight, there are always things about our albums that I can be critical of,” he continues. “‘I wish that I had done this differently’. But at the time we’re making them, we have to feel like they are the most valuable thing we have created to date, or we aren’t done making it. There’s no, ‘Well it’s time to record it. We’ve got to put it out, so let’s put it out’. That’s never an option. Is it the best thing we’ve done? If you can say yes, if you can say confidently it’s the best thing we’ve done to date, that’s when it’s ready to be made. That’s when it’s ready to be put to tape, and pressed and sent off to your house. It’s why The Wonder Years are still creating records that are peoples favourite The Wonder Years records. It’s why they’ve gone from playing Watford Rugby Club with more people on the stage that off it, to selling out London’s KOKO or having to announce a second date at Islington Academy. The first time they played Jacksonville in Florida, it was in someone’s living room, and it was so small, their keyboard player had to stand in the kitchen. ‘Sister Cities’ is the best The Wonder Years record yet. “I feel better than I’ve ever felt about a record before in my life. This is number one. I feel really good,” Dan beams, full of pride and bursting with excitement. “The thing we’ve always said, is we want to push forward each record. We never want to say, ‘Well, that one went pretty well, what if we make it again?’ That’s never been an option for us. “I said this at the time, but ‘No Closer To Heaven’ was a hard record for me to write. I was in a rut as a writer. I’m still super proud of it, but if I look at it with a critical eye, I can go back and say, we could have taken a few more risks. It was difficult to write because I was feeling so anxious about it and I was having such bad writer’s block, and I was so unprepared to write it. That’s where the preparedness mattered on this one; we were so ready to write a record, it was almost the opposite of the writer’s block. “Each time we want to take one full step. One full step from ‘Suburbia I’ve Given You Everything and Now I’m Nothing’ to ‘The Greatest Generation’. One full step from ‘The Upsides’ to ‘Suburbia…’. We wanted to take one full step from ‘The Greatest Generation’ to ‘No Closer To Heaven’. “I think, if I’m self-critical, we took three-quarters of one. In a lot of ways, we took a really bold step, and then in some ways, maybe just because I was so second guessing myself, we didn’t take the full step we needed to take. We held back a little bit. I feel like we took it this time, and we took the quarter step we should have taken last time. This is where it should have been. This record is where it’s all been going. If you’ve been listening to the band for the past eight years, it’s all been trending to here. If you’re a fan of the band, you’re going to hear this record and go, ‘Oh yeah, obviously. Of course this is where it’s been going. This makes so much sense to me now hearing it’. ‘Sister Cities’ feels like a complete story. The beginning is known, and the end is left open, but every detail, every thread, and every movement all pull in the same direction. The colours are rich, and the band let them run. “We did a better job of editing. It’s eleven tracks and not fourteen; it didn’t spill into two LPs because we couldn’t cut down on anything. It ebbs and flows wonderfully. I’m just so immensely proud of it in its entirety, the way that it shows itself up and where the peaks and valleys are as far as the dynamics. I feel like it’s a very dynamic record. There was that thought of, let’s push it. Let’s push it and see where it goes, let’s not be afraid of it. The idea of ‘No Closer To Heaven’ came as Dan sat on the front step of his house, writing the phrase “I’m no closer to heaven, but I’m going to keep walking,” in a notebook. ‘Sister Cities’ came into focus in Santiago, Chile. It seems almost too obvious to say they’re worlds apart, but here we are. “I see ‘No Closer To Heaven’ as a record about understanding that maybe all of our goals aren’t entirely attainable but that doesn’t mean we shouldn’t be evolving and learning. Just because we might never understand everything or be the absolute perfect version of anything, doesn’t mean we should stop striving to be that. That’s that record to me, and I think its encapsulated in that last verse of the last song,” he begins. “The crux of this record is that there’s this fundamental misunderstanding that I’ve been presented with, that many people have been presented with their entire lives,” he continues. “You’re told that the world is so big and so vast and so different and foreign from you. That people are so different. That cultures are so different. And the things that they do are almost unaffected by the things that you do. We found that this is fundamentally untrue. The world, as big as it is, is not all that big. These people that you are taught are so different, maybe adversarially different, to you, are not so different. “Humanity is a great equaliser. Most people are kind and loving. We’ve had the opportunity to go to a lot of places and meet a lot of people and experience a lot of cultures, and I think we’re in this year, these several years - and this harks back to ‘No Closer To Heaven’- where it’s felt like everything is crumbling. Everything has felt very divisive. There’s a lot of conversation about walls and barriers, and this person is your enemy, these people are your enemies. There’s been this creation of these paper tigers. As we go through the world, you realise these people are just like me. “Everyone is very similar. Everyone loves, everyone wants to be loved, everyone experiences joy, everyone experiences devastation, we succeed, and we suffer together. It’s a record about how important it is to connect with other people and understand that, while in your mind you are very important, your life is very important and has value, everyone has that in their mind. No person is less important or less valuable than you. There’s a joy to these discoveries. A sigh of relief that what they hoped might be true, is. A wide-eyed embrace that it’s bigger and more powerful than they could have hoped for. The fact they faced it, explored it and documented it together gives ‘Sister Cities’ a whole lot of soul. “A lot of those memories are really positive, and then obviously there’s obviously going to be some painful ones in there that aren’t going to be particularly fun to relive but are important to relive. “Every song on the record has its unique space, and some of those live in a space in loss because some of those events are events where you lose people, or you almost lose people. They have an equal importance to the pantheon of the record. Everything is about a different event or series of events, and how they tie into the place that we are. “For a song like ‘Raining In Kyoto’, that’s a song about my grandfather passing away as I got to the airport to do a tour of Japan. I was not able to attend his funeral so I went to this temple in Kyoto that had this Inari shrine and it was pouring down with rain on us all day. I walked up the stairs, and I saw that there were these enclosures and I saw that they were filled with wax. I understood that people had been lighting candles and leaving them there. I thought that I would light a candle and think something, or say something in regards to my grandfather. I would have some sort of ceremony even though I didn’t know what the ceremony meant or if it meant anything at all. I would light this candle. Those connections with other people are the heroes of ‘Sister Cities’. Some, like ‘Pyramids Of Salt’, are scarlet and don’t need pulling apart. Others, like ‘We Look Like Lightning’ are found in places you’d never expect. That song came about because in one year, The Wonder Years took forty flights. “There’s a certain feeling I get where I’m in the air where I almost I feel like I cease to exist until we’re back on the ground. It’s like I‘m nowhere. Air travel can be terrifying. Just by the odds, some of those flights were really rocky. You think, ‘Well I’m going to die right here, in this aeroplane, full of people that all look terrified and we’re all strangers, and we’re all going from one place to another, and we’re all going to die together right here. That feels strange. The title-track roars with the kindness of strangers. Of home and heart in foreign lands. Of it not actually being all that foreign after all. “The record had a series of working titles before we landed on ‘Sister Cities’, and we landed on ‘Sister Cities’ when we were in Santiago, Chile. We had found out just before boarding the play that the show we were going to play in Chile had been cancelled. There’s always a little sense, when you’re in another country, of alienation or lonesomeness or otherness. You’re in a place, and you don’t live there, but now there’s no practical reason for me to be there at all because there’s no show. “We were wandering around, and most people are just going about their lives, just passing us by. We’re unrecognised by them, we don’t understand what they’re saying, they don’t understand what we’re saying, and we just pass each other.” There was this feeling of, “We don’t belong here. It’s not that we’re not welcome here, but we are strangers with no practical purpose in this place. “We decided we’d walk to get some food, so we walked through the bus station, and there are so many stray dogs just everywhere. I almost felt this sense of commiseration with them in this moment because well, here you are and here I am. We’re both in this bus station, in Santiago Chile, and we both have nowhere to go, and nobody particularly wants us here. I thought I’m going to bring you back the rest of my dinner, and we kept walking. “Before we found a restaurant, we found ourselves under these huge, couple-storey-high obelisks that reach up towards the sky. I read that they are the monuments to the Sister Cities of Santiago, Chile. Standing there, the stray dogs are reminding me of a place; the air temp is reminding me of a different place. The air, the altitude, the mountains are reminding me of somewhere else; the graffiti of somewhere else and the architecture of another place. I feel like I’m in ten places at once. I feel like I’m everywhere at once, here. Then, the band found a group of people from the local music community who said, “You have to play a show. We were excited to see you and when are you ever going to come back to Chile?” The band apologised, explained that it wasn’t their decision to cancel and were met with a resolve to make it work. That day was important for The Wonder Years, as so many of them were. ‘Sister Cities’ is full of these overwhelming waves of hope, belief and faith. “Pretty much every day was inspiring. Everything we saw was inspiring, that’s why writing it all down was so helpful. I could see this was an important day. This was an important five minutes. That was an important one second. “The one thing that happened here had a fundamental impact on how I thought after it. What I saw was more people connecting than more people dividing. That’s the important thing. We are in a time frame where we are presented with divisiveness very consistently but in a practical sense, on a city street, in a baseball stadium, at a monument, in an airport, what I saw was more connection than division. ‘Sister Cities’ finds these big ideas in the little moments. In a caught eye, shared space or simply doing things their own way, The Wonder Years celebrate humanity at every turn. Six albums in, the band can afford to be cocky, to get confident. To indulge in being rock stars, but they never do. They’d rather strive for more. They want to be better. Trashing a hotel room is pretty much rock’n’roll cliché number one, but the video for ‘Sister Cities’ sees them taking the opposite path. Alongside snippets of stories and postcards of other lives, it deals in the aftermath through the eyes of the cleaner, who has her own story to tell. It constantly and defiantly feels like The Wonder Years are never trying to be something they’re not. The Wonder Years’ album ‘Sister Cities’ is out 6th April. Taken from the April issue of Upset. Order a copy or subscribe below.